It is unknown if Tampa Bay Lightning goalie Ben Bishop can play Game 5 of the Stanley Cup Final on Saturday against the Chicago Blackhawks. 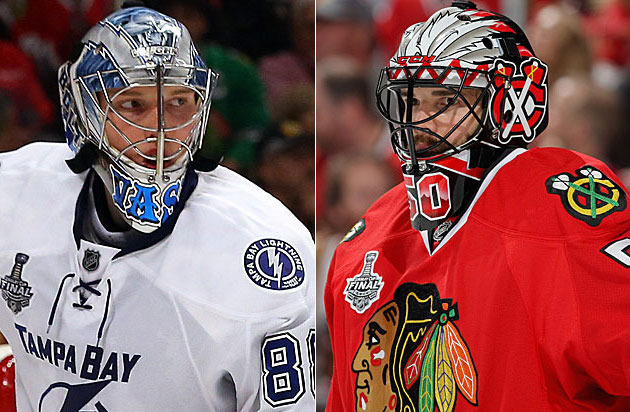 Kevin Woodley breaks down the Game 4 performances of Chicago Blackhawks goalie Corey Crawford and Tampa Bay Lightning goalie Andrei Vasilevskiy. Pittsburgh Penguins forward Pascal Dupuis has been cleared to work out and take contact. Buffalo Sabres center Cody Hodgson remains a candidate for a contract buyout, Sabres general manager Tim Murray said Thursday, according to Buffalo radio station WGR-550. The Carolina Hurricanes have signed forward Lucas Wallmark to a three-year contract. The Winnipeg Jets have agreed to terms with forward Chase De Leo on a three-year, entry-level contract. The New York Islanders have reached an affiliation agreement with the Missouri Mavericks of the ECHL for the 2015-16 and 2016-17 seasons. The Chicago Blackhawks got the win they needed in Game 4 of the 2015 Stanley Cup Final, tying the best-of-7 series, but that doesn't mean they're pleased with the performance. Chicago Blackhawks forward Andrew Desjardins tells NHL.com in his latest blog that they must continue to focus on their checking game against the Tampa Bay Lightning. The Tampa Bay Lightning were looking at the bright side of life after a 2-1 loss to the Chicago Blackhawks on Wednesday in Game 4 of the Stanley Cup Final evened the best-of-7 series at two victories each. Chicago Blackhawks forward Brandon Saad has eight goals in the 2015 Stanley Cup Playoffs, including one in each of the past two games of the Final. Chicago Blackhawks coach Joel Quenneville changed his lines and they were on the ice for each goal in a 2-1 win against the Tampa Bay Lightning in Game 4 of the Stanley Cup Final. Ben Bishop once recruited Scott Darling to the University of Maine as his successor; now the two tall goalies meet at opposite ends in the Stanley Cup Final. Ottawa 67s forward Travis Konecny credits hockey for helping him develop socially as well as physically. The Chicago Blackhawks' strong penalty killing has given them an advantage against the Tampa Bay Lightning in the Stanley Cup Final. Chicago Blackhawks defenseman Johnny Oduya played more than 25 minutes in a 2-1 win against the Tampa Bay Lightning on Wednesday.